What about a wonderful silvery sea blue? Not too bright and not too dark -- it would keep the room feeling cool and airy. As to window coverings, what about something like bamboo blinds? Airy, yet some shade from the sun? 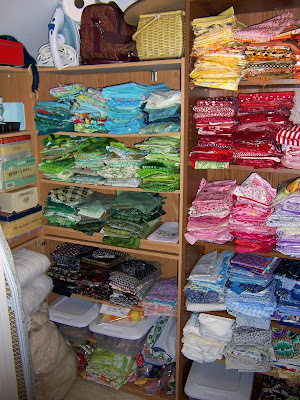 Your workroom is heavenly!! All that fabulous natural light!! 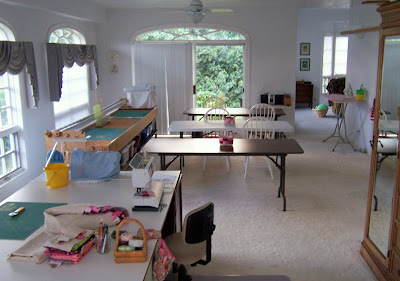 Love your workroom... what I would give for all that natural light! I also really like the Corn Husk color. I will have to remember that. As for as color ideas, what about a Tiffany blue... or a really pale turquoise... I think either would go nice with white plantation shutters. Ok, I am jealous... can I come for a visit???? My first thought was pale turq or blue, then lilac, or even pale seafoam. Cool colors. Then I saw the pastel dots on your header... one of those colors! Love your room and so much fun. Please let us in the fun..ha ha. Don't forget pictures, I think we would all love to see what wonderful ideas come up. I'm thinking that bold colors might get reflected in your fabrics as you work in the room, But at the same time, white get a little old. What about beige walls, with the ceiling being either a couple shades lighter (if the ceiling is low) or darker (if it is high), with the white window and door trim. If beige is too blah, maybe a very pale purple? I can't wait to see what you do! What about Bridal Blue B54-1 from Olympic paints? It's a lovely pale blue and it goes nicely with the Corn Husk green. Sorry to be so strangely specific but I had these paint samples from Lowes in my drawer for future projects!!! I'd continue with the green from the computer room. I love your spare look. And less cleaning sounds fabulous to me. I am trying to move in that direction. What about Roman shades for the windows? 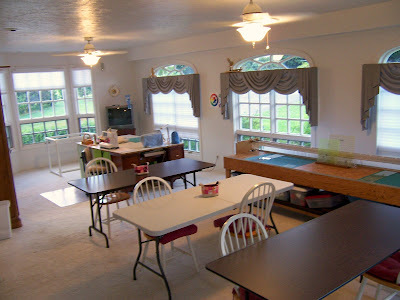 I made some for these long, stained-glass windows in my old place, and they were easy and didn't use a ton of fabric. Also, I lined them with Blockout Curtain Liner, so the fabric was saved from bright sun. As far as your studio goes I'm thinking white or a close neighbor of white would still be the best choice so it doesn't alter what your fabric looks like as you are working. One way to add color to the walls would be to add it at the lower level of the room... add some decorative molding 3 ft up from the floor and put your color on the bottom part of the wall. Or You could just add color to the long wall where you ironing board is. How about adding colorful design elements on the walls in various places. Pick a design element you like from fabric and enlarge it and paint it on the wall... I'd probably grab something from Moda's Posh line. Or how about giant quilt blocks tumbling around the room? When you get tired of whatever you paint you can just paint over it... bahh, bye! Windows... light sheers to diffuse the sun - otherwise nothing... just the glorious view! I am jealous of your wonderful large light filled space and can't wait to see how you finish it. You could paint just the outside walls a blue/green (the color of the ocean), leave the windows with blinds, no curtains, but make sure the blinds are white to match the trim. By accenting the outside walls with a color and keeping the windows bare you'll still have a clean look with some freshness. 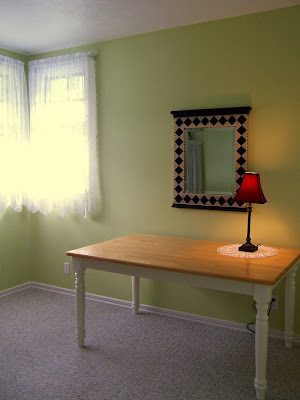 Well, Lisa, while reading your post I had a brilliant idea for the new color for your sewing space...then I came to read the comments and, it seems as though I'm a day late and a dollar short on this one. I, too, thought of blue to bring the ocean inside. My studio is painted a pale blue with a lavender tinge...very soft and soothing and doesn't clash with colors on the design wall at all. I have a large space to work in...at least I thought I did...till I saw yours...Do ya need a sister?????? 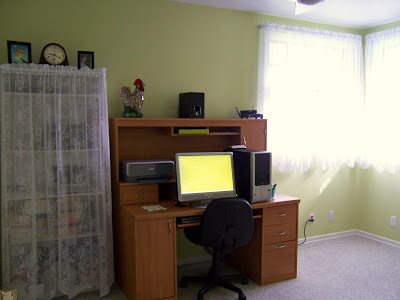 It would be best to keep the walls in the workroom white so that your color perception isn't distorted. I would definitely use white wooden shutters on the windows, the kind that will fold back on themselves to the sides to let in light when you want, but will close to control too bright days. The moveable louvers would let in the air flow even when closed. I can see what you mean about the funeral home window treatments! BTW, love love love the green. It's gorgeous! 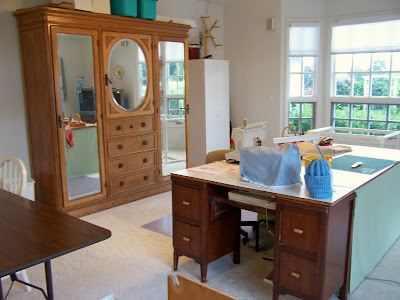 I'm soooo utterly jealous about the size of your sewing room! What a lovely airy room. Too bad about your insect/mildew/blowing dirt problems. Love the "corn husk" with the red! Well, white is probably best as far as not interferring with your fabric colors, but what about a very pale peach with some white sheers that could be thrown in the washer often? You could always sew a strip of some lovely island print on the top or bottom if you wanted more color. Can't wait to see what you do with it. Judy B.
I was going to say robin's egg blue.... and then I glanced at many of the comments and see that is popular! I live in HI too (Big Island, Hilo side) and I know all about the dust, mold, see breeze, etc.... Of course I live with 4 males, so we're not so minimalistic as you are! I noticed you had carpet in one room. I'd ditch that in favor of hardwood flooring or tile... makes ALL the difference! I painted my quilting room a supernova-bright safety yellow. It was supposed to be a soft gold. Oh well. I absolutely panicked while I was painting, because I'm not a bright yellow kind of gal, but now I love it. In the morning it brings in the sun and in the evening it darkens to a rich orange that's just beautiful. Good luck! oh sistah, I am on my way ovah r'now!!!!! What yu tink? Good ideas, yea? Ya don't like the cockroaches, huh? Man, I remember them well from small kid time. I would say bring in the color of the ocean.. but in a pale color rather than bright ones. Evidently I just missed you when I was at Kaupai(SP) Stitchery last Friday the last full day of my cruise. The shop is super and when I mentioned that we had walked from HH down to the shop the store manager drove us back up to HH! Wow what service. I loved every minute of it and bought one of your patterns and fabric to bring back to snowy Oregon with me. Thanks for the info on your link to shopping in Hawaii. I printed it off and managed to get to three of the stores. Two in Hilo and one in Kuai. Our cruise was wonderful and the Napali Coast incredible. I could move there but would miss the seasons (but I could get used to it!). I have to agree about the blue.. it would make it feel cool and airy. I hunted up your blog because, in rereading your book you asked a question that you claim to actually want an answer to... what else do you do while quilting? My answer is audio books. They keep me interested... but there is nothing to look at so I have to keep looking at what my hands are doing. Hi Lisa, I love your workroom. WOW that is one big room. And I do love the open unclutter look. Quite unlike what I have. lolol Too much stuff. 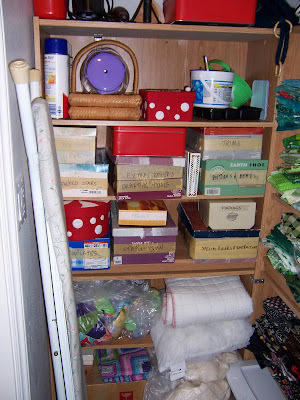 I'm sorta feeling like you and wanting to declutter. With moving in my near future now is the time I'm thinking. I love your green room and you know I love that RED lamp. Perfect. I would leave your workroom white but that's just me. You cant get much cooler feeling that white. Wow- how great to have all that room! I'm with you on leaving the trim white. Way too much work to paint it! So glad to see you back in blogland! We've been missing you. I wonder what the previous homeowners used that lovely large room full of natural light for? I'm with the very pale aqua group - such a nice, cool color, and will look wonderful with the already existing white trim. You're back! I was so tickled when I got a comment from you. I was jumping for joy... I've missed you!!!! I've got a whole bunch of delicious posts of yours to catch up on. Oh happy day! My 2 cents... and I so can relate about the bugs, and humidity... a soft butter yellow. I think yellow works with any color and any season (even though we both know there's only one season in HI). It's light and bright, yet still soft, cozy and warm. Ok, I think I've just put in 7 cents. PS... I googled the lyrics for America the Beautiful... and it IS "fruited"! That pattern I used was wrong. Oh well... it's different at least. Next time I get the little red squiggle of doom under a word... I will trust it! I agree with Renee -- Tiffany blue, but slightly more pale than the true color of the box. It would be calm and relaxing, and blend with the outside view. Can't wait to see the choice you make! OH I LOOOOOVE YOUR ROOM! Totally awesome! I'm definately in awe!